Got stress? Most of us would say yes. In fact, we often say, “I’m stressed out!”, or “I hold my stress in my neck, lower back, etc.” Stress can be physical or emotional, and most of us accept a certain level of stress as a simple fact of life. This seems to be especially true in these times of multi-tasking due to the increasing demands of our time, finances, home maintenance, work, traffic, relationships, children, and politics – the list goes on. Our bodies react instinctively and lightning fast to physical and emotional stress. Our muscles contract in predictably protective patterns, and there are physiological responses in every system of our bodies, i.e. increase in heart rate and blood pressure, blood sugar levels rise, and digestion slows. These reflexive responses are designed to protect us. To balance our protective reflexes, all mammals have an inherent relaxation response. It’s like a reset button for the body and nervous system. Think about how a dog shakes, for no apparent reason, multiple times a day. Animals have it figured out! They literally “shake it off”. Here is how it is supposed to work; once the stress/threat has passed, the body naturally “shakes out” this deep muscular tension which releases and “completes” the cycle. This restores the body and nervous system back to a natural, relaxed baseline with no residue or shadow of the event. Brilliant! Unfortunately, humans are the only mammals who don’t instinctively activate this relaxation response on a daily basis. Why? Humans are also the only mammals who have a cognitive brain; the part that rationalizes, justifies, and can override our instinctual responses. This is why humans get stuck. We over think things, rather than follow our instincts. Over time this has dampened our natural shaking mechanism. Our bodies carry the history of our life experiences. Therefore, it is essential that we include the body in our healing. Fortunately, we have not lost the ability to naturally heal ourselves. Dr. David Berceli developed TRE™ in response to his personal experience with PTSD during a long career working in areas afflicted by war and natural disaster. 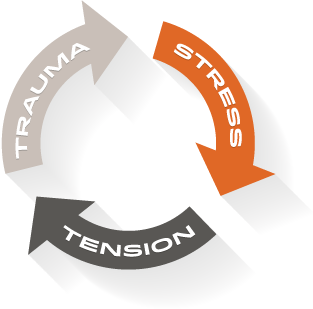 Combining his understanding of the trauma cycle and the human body with his deep curiosity, David developed a series of simple exercises designed to self-induce the natural human shaking process genetically encoded within us, signaling a return to safety and calm, allowing us to resolve chronic stress and trauma, heal, and begin anew. TRE reminds our bodies of the natural, intuitive, instinctual, powerful, and deeply healing response we all possess. All we need to do is let go, and give it permission. What is stress vs trauma? Let’s think of it as a spectrum. Everything from the stress of a deadline, or unexpected traffic, chronic stress of going to a job you hate, to the loss of a loved one, to more severe traumas including violence, abuse, or war. As we move through life, inevitably we will have multiple and ongoing experiences we perceive as stressful and traumatic. Without utilizing our inherent ability to “shake it off”, we hold the stressful experiences in our system. These experiences build upon themselves, and we begin to create a framework from which we will perceive our next experience. Over time, our system becomes hyper-sensitive and conditioned to react, respond, guard, and protect us as we anticipate what might happen – as if waiting for the proverbial ball to drop. Over time, we find our bodies and our minds are chronically tense. We experience this as fatigue, depression, anxiety, disturbed sleep, and disease. Chronic stress affects us to the very core of our being – mind, body, and spirit. triumph over the threat, our bodies will freeze, fold, and collapse. This is especially true in cases where trauma is ongoing and there is no opportunity to allow the natural completion of the trauma cycle. In some cases, this results in Post Traumatic Stress Disorder. Post traumatic stress literally means that we continue to experience disturbing thoughts, emotions, and feelings long after the trauma is over – becoming imprisoned in the past. The brain becomes conditioned to unconsciously perceive situations as similar to the the original trauma in hopes of a new outcome: triumphing, surviving, and evolving beyond the trauma. Learn more about TRE at http://traumaprevention.com. As a Certified TRE Practitioner, Megan combines her deep understanding of the body, and training in somatic counseling, with presence, empathy, compassion, and intuition to provide a safe and healing experience, allowing for profound transformation. “I noticed a shift beginning at our first session. Thank you again for helping me live in the moment and not in the past”. I had a great experience learning TRE™ at Bodywise. The session was very powerful, and Megan made me feel completely at ease. She was kind, held safe space beautifully, and is clearly very experienced in her work. Best of all, she made me feel empowered to help myself by continuing TRE™ at home, which I greatly respect and appreciate. I highly recommend Bodywise, and applaud the work they are offering in the community. Thank you, H.C.